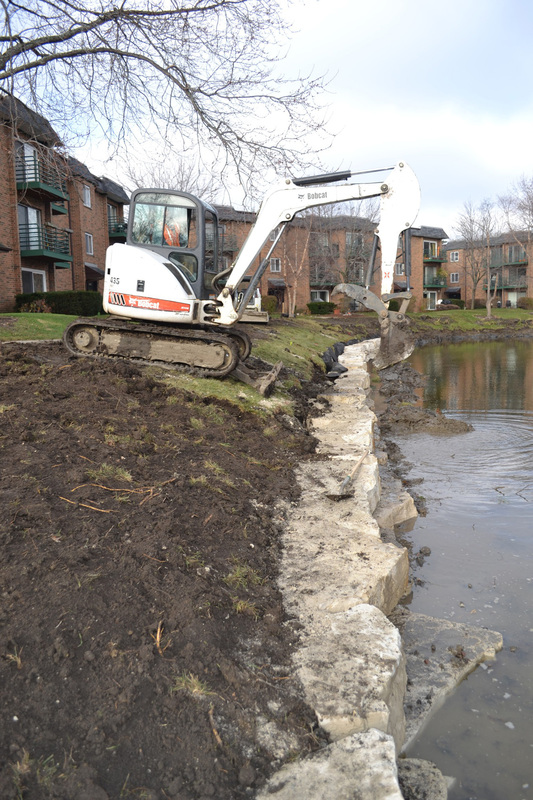 Hidden Pond HOA – Shoreline Stabilization | ENCAP, Inc.
Hidden Pond HOA in Schaumburg, Illinois, contracted with ENCAP, Inc. in the winter of 2012 for design-build services to stabilize the shorelines of their steeply eroded stormwater basin. The HOA requested a unique and aesthetically pleasing design, and chose to use Eden outcropping stone for their shorelines. ENCAP, Inc. produced a native landscape plan, which was approved by the HOA, and construction began immediately afterward. The stone placement and shoreline grading took about two weeks, and the outcome was excellent. 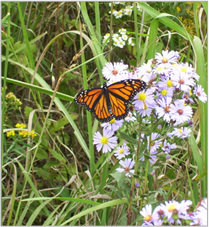 The following Spring, ENCAP, Inc. crews returned to install emergent native plugs and some upland species as well. This provided additional shoreline stabilization, as well as a functional aspect to the aesthetics of the pond. The Hidden Pond HOA was so pleased with the work, that ENCAP, Inc. was contracted to stabilize another pond, utilizing similar design and construction techniques.